This landscape of the Hudson, and the Atlantic Sturgeon are on the endangered list…this is a view south from Piermont, NY towards Manhattan. An extremely rare view with no major buildings or other obvious signs of civilization interrupting the natural beauty. Read more about the Atlantic Sturgeon, one of the oldest species of fish. It doesn’t have scales and can grow to 600 lbs or more. 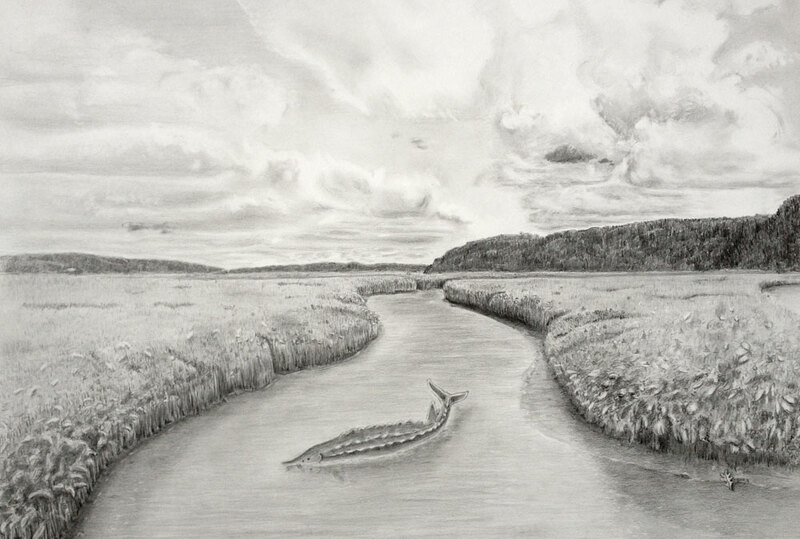 Posted on June 21, 2014 August 30, 2014 by friggsrealm	This entry was posted in Landscape, Weird Scenes Inside the Gold Mine and tagged 10968, atlantic sturgeon, Endangered, Hudson, Hudson river, Hudson valley, Lauren bellon, Marshes, Marshland, Pencil drawings, Piermont, Piermont ny, Pollution, Riverkeeper, Sturgeon, Waterways. Bookmark the permalink.